Along with the support of over 100 people and coalitions who fight for equity and justice in Orleans Parish, Take ‘Em Down NOLA and the New Orleans Workers Group held a #J20NOLA Anti-Trump Inauguration Rally & March on January 20, 2017, at 3:00PM, beginning on the steps of New Orleans City Hall, 1300 Perdido Street, to Duncan Plaza, across from City Hall, and into the streets of downtown New Orleans. On January 20, Trump became President and started to unleash a campaign of impoverishment, war, extreme racism, sexism, and homophobia. The plan to exploit and neglect the environment, imprison, deport and discriminate against immigrants and Muslims is dangerous and real. Pretending to be for “the people” his billionaire cabinet is filled with white supremacists, environment destroyers, war crazy generals, and opponents of any social benefit we have won. We will seen an increased curtailment of constitutional rights, more prisons, and less education. His cabinet is also a who’s who of Wall St. banks, hedge funds, fast food moguls, and opponents of higher wages. Therefore, rather than be overwhelmed and feel defeated, we started the process of collective organizing toward tangle solutions to protect our communities and build toward equity for working class people, which includes those who are homeless or directly affected by mass incarceration. This intentional organizing has continued ever since #J20NOLA. The first six months were spent engaging residents of New Orleans in the creating a “Fight Back Manifesto”. This was phase one. 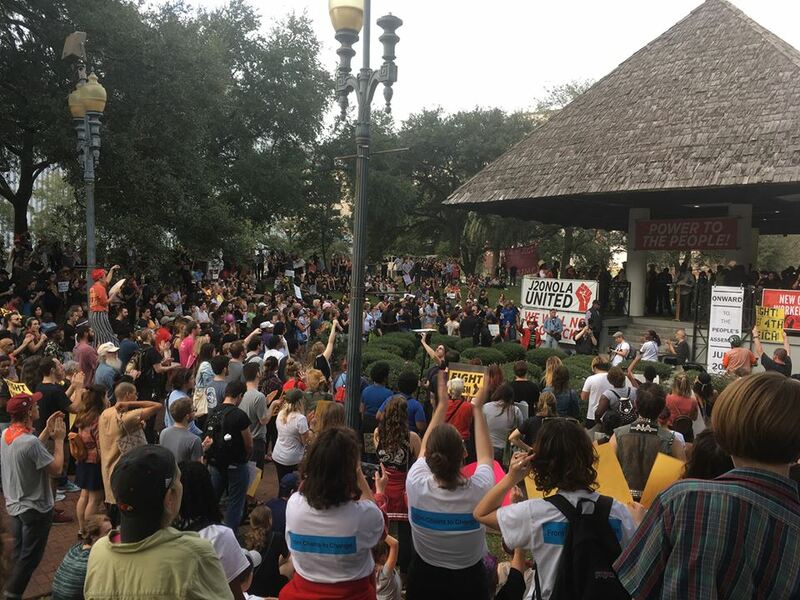 Now the The New Orleans Peoples’ Assembly is in Phase two, in ensuing that that demands outlined in the “Fight Back Manifesto” are made manifest through the power of the people. For the past few decades we have witnessed an assault by the rich billionaires and their government on the living standards of the working class. The rich have grown richer based on increased exploitation of us working people. It is time for working people to unite and wage relentless struggle to bring about better living conditions and political rights. Every advance in the past has been a product of struggle. If we want New Orleans to be better, we working people have to unite and make it better. This city could not function without us. Yet we reap none of the benefits of the billions brought into New Orleans by tourism. Indeed, since Katrina in 2005, things have gotten worse. This is the reason for us to build the Peoples’ Assembly, a mass organization of New Orleans workers that will fight the bosses, local government to demand better conditions: higher wages; affordable housing; improved public transportation, quality public education for our children and affordable health care. We also want to do it in an environment that is free of both symbols and systems to white supremacy, designed to oppress people. We see and understand that connection. We will tolerate NOTHING less than economic justice. 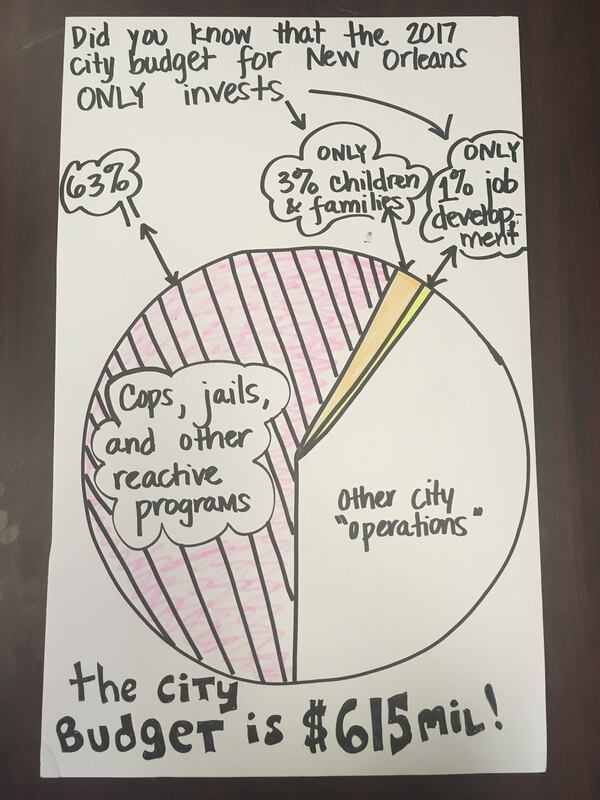 The 2017 city budget of Orleans parish designates 63% of $615 million dollars toward cops, jails, and reactive measures, while only allocating 3% of the budget to children and families, and 1% toward job development. The priorities of the city are clear based on where the money is going, and the little that is designated for children, families and job development is not necessarily for the kinds of programs that are accessible, sustainable, community based, nor solution oriented. So rather than complain about it, or give in to the powers that supposedly be, we organize toward solutions. The people have the real power. We must now exercise it. Our number one priority is to secure the resources needed to make what we support reality. Although our program may not cover every single issue and instance of concern, it does address key areas that we collectively are affected by, and must organize for, as immediate priorities. As we achieve these demands, we will be in better position to expand our goals. We oppose and will resist what harms our communities, while building toward tangible solutions to allow the masses of working class people a chance to live lives that are healthy and whole.